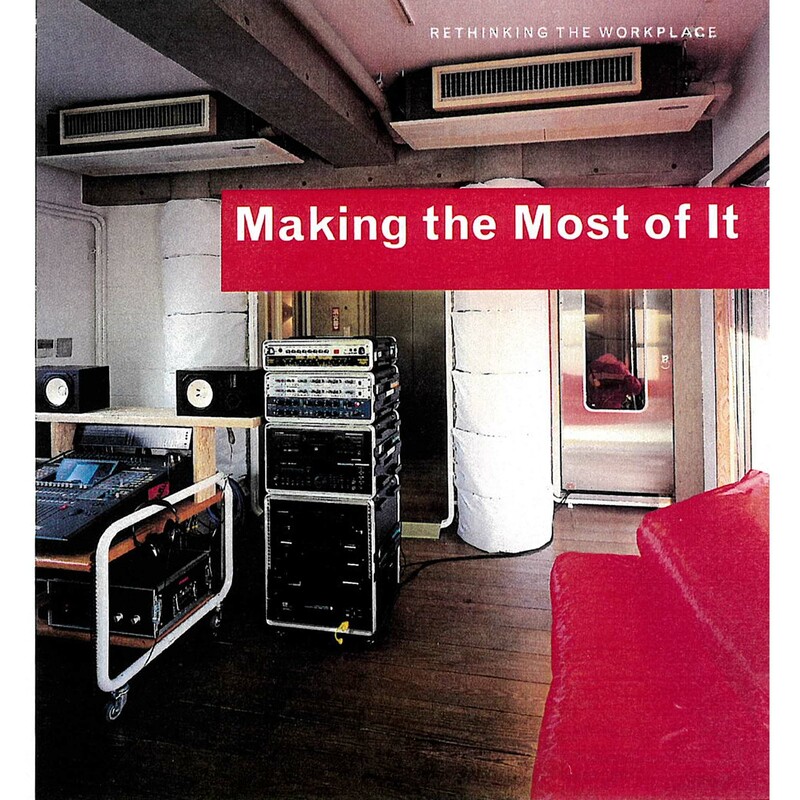 " Making the Most of It "
Tokyo composer, DJ and producer Cornelius works in two minuscule spaces; his 32.5 square-meter studio and his 13.5 square-meter office. He asked Guesthouse to give him maximum result on a minimum budget of $40,000. And to top iy off, the final product was to be a place that would make him feel at home. Mikiko and Jiro Endo of Guesthouse gave the studio a go. Their approach relied on three determining elements. First, all furnishing are made of all hollow metal tubing, 38 millimeters in diameter and spray paired white (top-right). The tubular system function as 'visual infrastructure' and conceals all wiring . The second element is the fluorescent orange sofa (top left). Clad in clear PVC, the sofa is filled with transparent plastic balls and illuminated from below by eight fluorescent lamps. Sitting on this sofa is like floating on water. The final eye-catcher is the drum room, where acoustics are regulated by green cotton cushions and white fire resistant plastic. 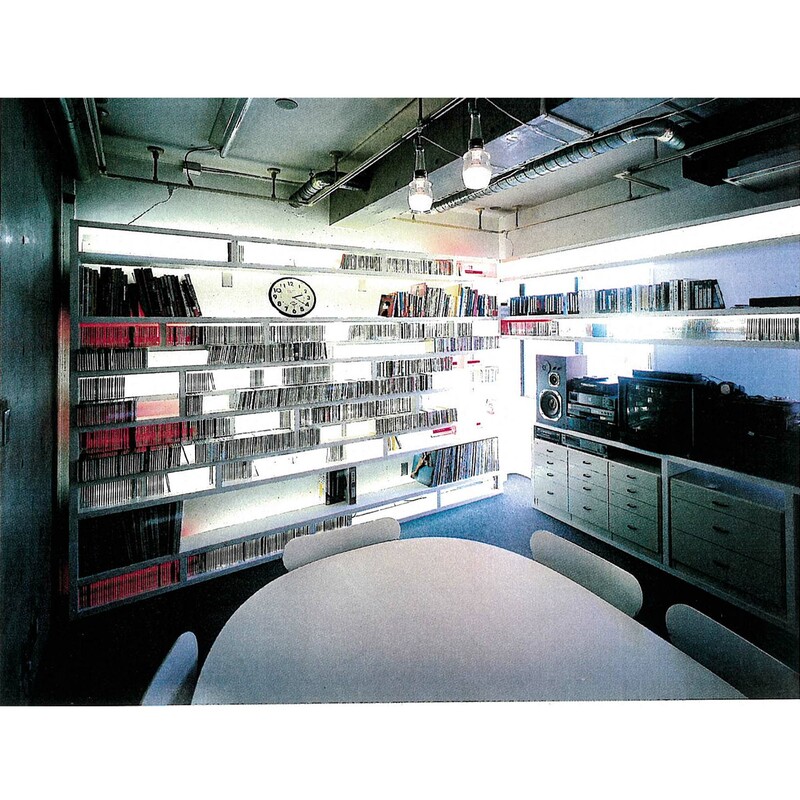 The infinitestimal office was designed by MasafumiSumiyoshi and Jiro Endo, who managed, despite the odds, to provide the sense of spaciousness. A big factor in their success is the cabinet for CDS and LPs, which they made twice as deep as necessary, positioned in front of a window and lit from behind.